The final game last week of Phillies Instructs against the Yankees Instructs gave us hope for a better future. But the future is a long way off. They won the game convincingly, 6-1, but that was not important. What was important that all seven pitchers in the game had “swing and miss” stuff, striking out 14. They had some pop in the lineup. One batter, corner outfielder Ben Akilinski, hit two home runs. The left side of the infield performed credibly with Alec Bohm and Luis Garcia each having base hits. You can read more about the final Instructs game in the previous blog, HERE. For me, the most important question that needed to be answered in Instructs is this. Do the Phillies have a long term solution at third base and shortstop? Clearly, both Bohm, the 2018 first round draft pick, and Garcia, the big international signing from 2017, can hit based on what we saw at Instructs games. Will Alec Bohm and Luis Garcia be the answers on the left side of a future Phillies infield? It’s clear from the scouting reports over the last few weeks that Luis Garcia will be an elite player in the middle infield. He looked great at both both second and shortstop in the Instructs games we attended. Jim Salisbury, of nbcsports.com.Phildelphia, posted a recent article about Garcia after he was named the top prospect this year in the Gulf Coast League by Baseball America, Read HERE. The verdict on Bohm is not as optimistic on his defense. We have seem him make a couple of errors at third in Instructs games. Brookover quoted a scout as saying about Bohm, “most of the time college players come into professional baseball, you don’t see the guy at his best. You’ll see the real guy in 2019. I do not think he will be a third baseman”. Another infielder gets high grades from a Phillies assistant General Manager, Bryan Minniti. He is Logan Simmons. Minniti said in the Brookover post, “he’s one of the guys you haven’t heard of yet but you will soon”. Simmons was a sixth round draft pick in the 2018 draft. 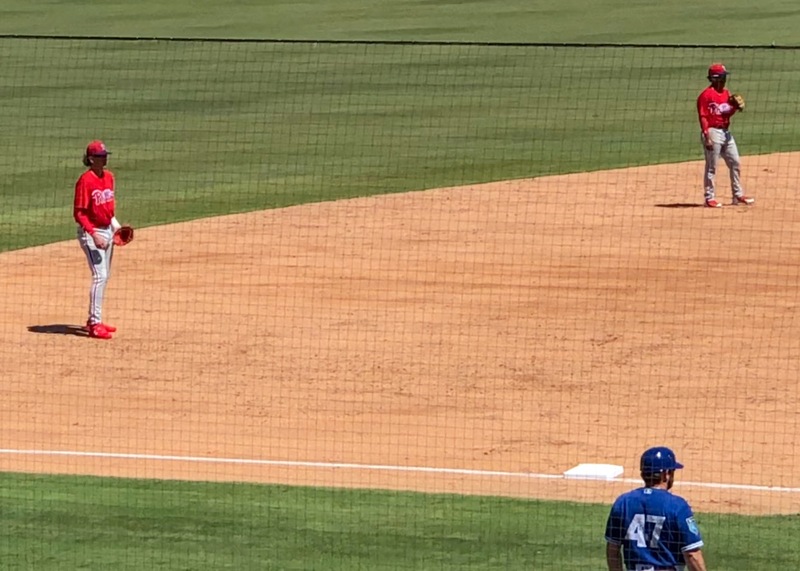 Could this be the likely Phillies infield in the next couple of years: Bohm at third, Garcia at short, Scott Kingery at second and Rhys Hoskins at first? The 2019 season should tell us a lot more. This entry was posted in 2018, October and tagged Alec Bohm, Baseball Betsy, Bob Brookover, Brian Minniti, Jim Salisbury, Logan Simmons, Luis Garcia, Philadelphia Phillies, Phillies 2018 Instructs, Rhys Hoskins, Scott Kingery. Bookmark the permalink.